How Much Work Can One Molecule Do? 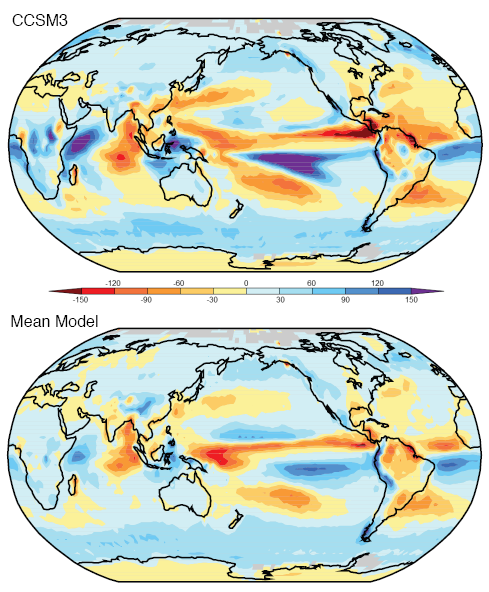 There are many misconceptions about how atmospheric processes work, and one that often seems to present a mental barrier is the idea of How much work can one molecule do? 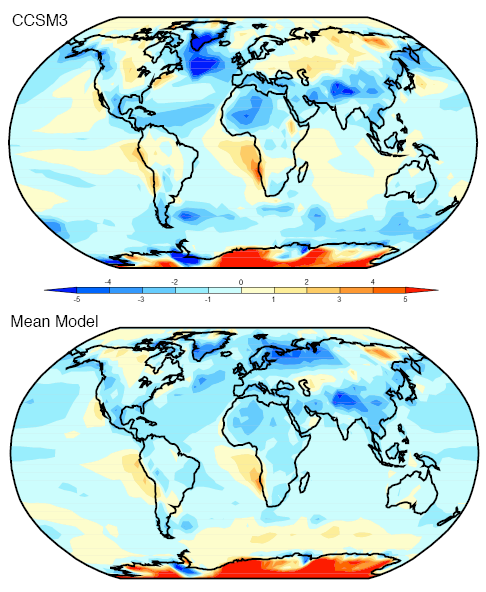 This idea – presented in many ways – has been a regular occurence in comments here and it also appears in many blogs with eloquent essays on the “real role” of CO2 in the atmosphere, usually unencumbered by any actual knowledge of the scientific discipline known as physics. Well, we all need mental images of how invisible or microscopic stuff really works. When we consider CO2 (or any trace gas) absorbing longwave radiation the mental picture is first of trying to find a needle in a haystack. And second, we found it, but it’s so tiny and insignificant it can’t possibly do all this work itself? How much can one man or woman really do? This article is really about the second mental picture, but a quick concept for the first mental picture for new readers of this blog.. Think of a beam of energy around 15.5μm. 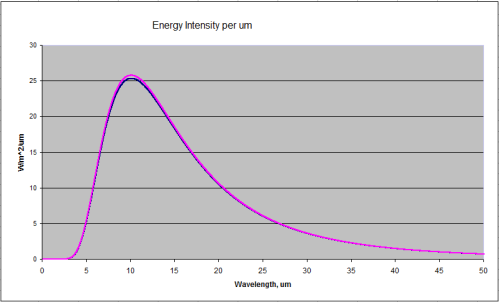 Here is the graph of CO2 absorption around this wavelength. It’s a linear plot so as not to confuse people less familiar with log plots. 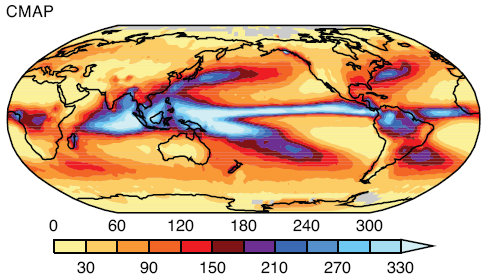 Water vapor is also plotted on this graph but you can’t see it because the absorption ability of water vapor in this band is so much lower than CO2. The vertical axis down the side has some meaning but just think of it for now as a relative measure of how effective CO2 is at each specific wavelength. 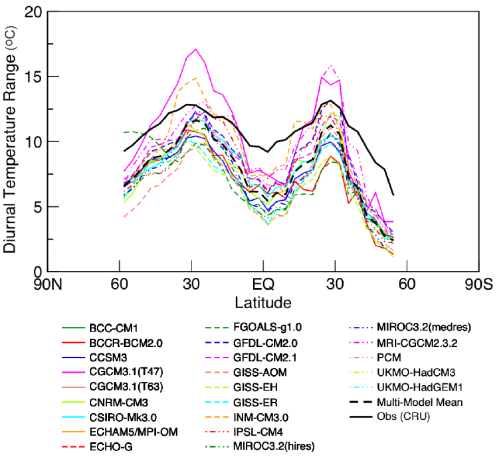 Here’s the log plot of both water vapor and CO2. You can see some black vertical lines – water vapor – further down in the graph. 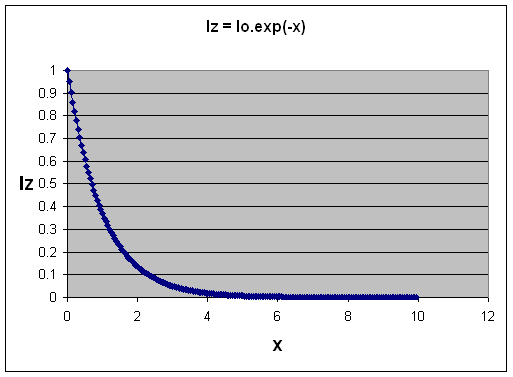 Remember as you move down each black horizontal grid line on the graph the absorption ability is dropping by a factor of 100. Move down two black grid lines and the absorption ability has dropped by a factor of 10,000. Spectralcalc wouldn’t churn anything out – nothing in the database. 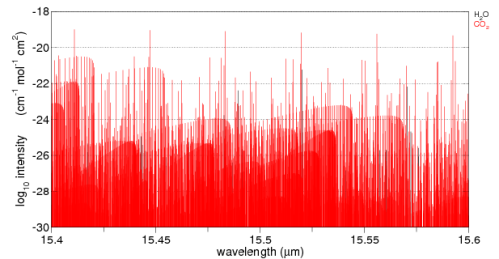 15.5μm photons go right through O2 and N2 as if they didn’t exist. They are transparent at this wavelength. So, on our needle in the haystack idea, picture a field – a very very long field. The haystacks are just one after the other going on for miles. Each haystack has one needle. You crouch down and look along the line of sight of all these haystacks – of course you can only see the hay right in front of you in the first one. Some magic happens and suddenly you can see through hay. Picture it.. Hay is now invisible. Will you be able to see any needles? That’s the world of a 15.5μm photon travelling up through the atmosphere. Even though CO2 is only 380ppm, or around 0.04% of the atmosphere, CO2 is all that exists for this photon and the chances of this 15.5μm photon being absorbed by a CO2 molecule, before leaving this world for a better place, is quite high. In fact, there is a mathematical equation which tells us exactly the proportion of radiation of any wavelength being absorbed, but we’ll stay away from maths in this post. 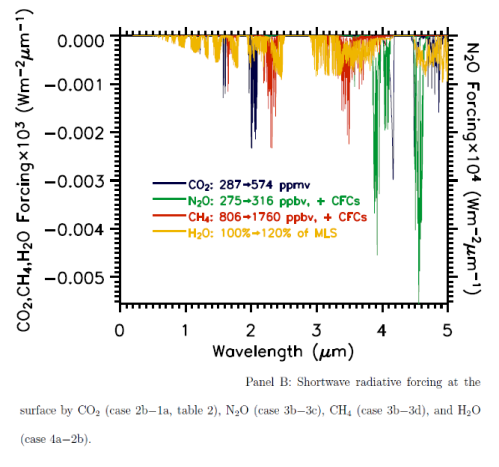 You can see the equation in CO2 – An Insignificant Trace Gas? Part Three. And if you see any “analysis” of the effectiveness of CO2 or any trace gas which concludes it’s insignificant, but doesn’t mention this equation, you will know that it is more of a poem than science. Nothing wrong with a bit of poetry, if it’s well written.. Anyway, it’s just a mental picture I wanted to create. It’s not a perfect mental picture and it’s just an analogy – a poem, if you will. 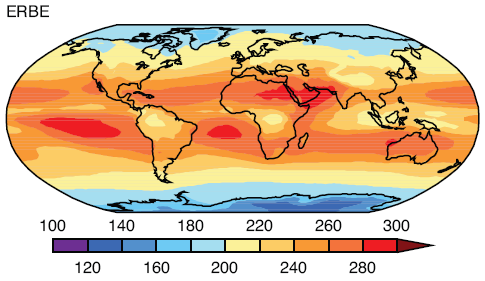 If you want real science, check out the CO2 – An Insignificant Trace Gas Series. 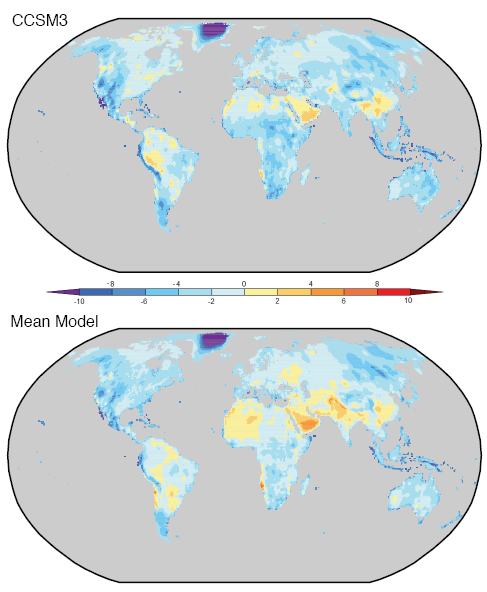 CO2 – The Stakhanovite of the Atmospheric World? Back in the heady days of Stalinist Russia a mythological figure was created (like most myths, probably from some grain of truth) when Aleksei Stakhanov allegedly mined 14 times his quote of coal in one shift. And so the rest of the workforce was called upon to make his or her real contribution to the movement. To become Stakhanovites. This appears to be the picture of the atmospheric gases. So there’s a large organization with little being done, and now we bring in the Stakhanovites – these champions of the work ethic. Well, even if they do 14x or 100x the work of their colleagues, how can it really make much difference? After all, they only make up 0.04% of the workforce. 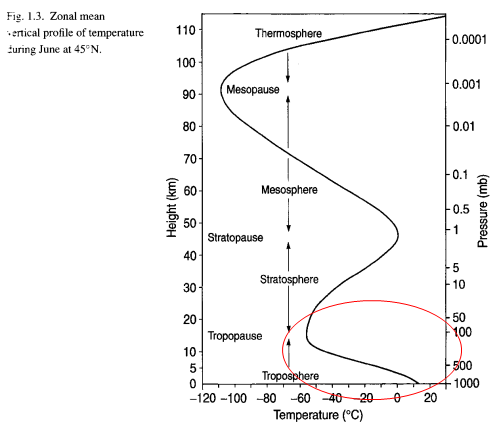 But this is not what the real atmosphere is like..
Let’s try and explain how the atmosphere really works, and to aid that process..
For everyone thinking, “there’s only so much one molecule can do”, let’s consider a small “parcel” of the atmosphere at 0°C. We shine 15.5μm radiation through this parcel of the atmosphere and gradually wind up the intensity. Because it’s a thought experiment all of the molecules involved just stay around and don’t drift off downwind. The CO2 molecules are absorbing energy – more and more. The O2 and N2 molecules are just ignoring it, they don’t know why the CO2 molecules are getting so worked up. What is your mental picture? What’s happening with these CO2 molecules? a) they are just getting hotter and hotter? So the O2 and N2 molecules are still at 0°C and CO2 is at first 10°C, then 100°C, then 1000°C? b) they get to a certain temperature and just put up a “time out” signal so the photons “back off”? What is the everyday life of a molecule like? It very much depends on temperature. The absolute temperature of a molecule (in K) is proportional to the kinetic energy of the molecule. Kinetic energy is all about speed and mass. 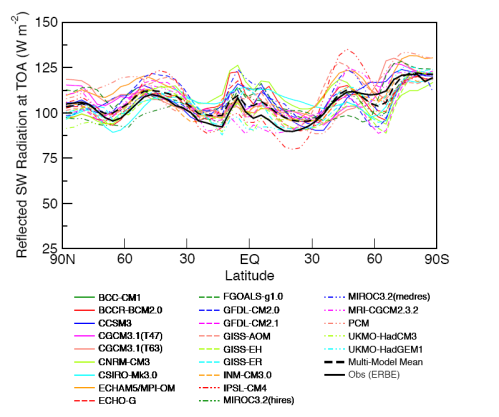 Molecules zing around very fast if they are at any typical atmospheric temperature. Here’s a nice illustration of the idea (from http://www.chem.ufl.edu/~itl/2045/lectures/lec_d.html). At sea level, a typical molecule will experience around 1010 (10 billion) collisions with other molecules every second. The numbers vary with temperature and molecule. Think of another way – at sea level 8×1023 molecules hit every cm2 of surface per second. Every time molecules collide they effectively “share” energy. Therefore, if a CO2 molecule starts getting a huge amount of energy from photons that “hit the spot” (are the right wavelength) then it will heat up, move even faster, and before it’s had time to say “¤” it will have collided with other molecules and shared out its energy. This section of the atmosphere heats up together. CO2 can keep absorbing energy all day long even as a tiny proportion of the molecular population. It takes in the energy and it shares the energy. The ability of a CO2 molecule to be “effective” in the atmosphere isn’t dependent on its specific heat capacity. Molecules have embraced “communism” – they share totally, and extremely quickly. One commenter asked about CO2 absorption in the solar spectrum. If CO2 absorbs incoming solar radiation then surely an increase in CO2 will reduce incoming radiation and balance any increase in longwave radiation. The important factor is the usual question of quantifying the different effects. 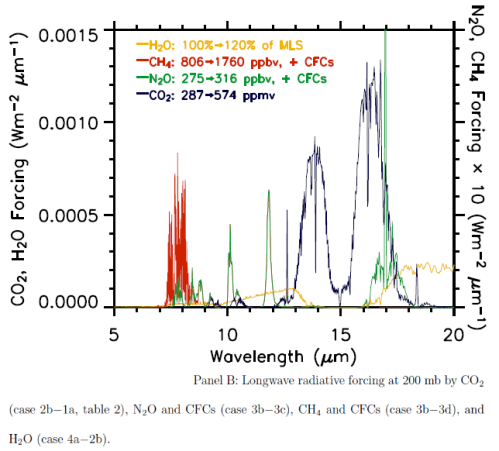 The CO2 absorption spectrum is from the line list browser of the recommended spectralcalc.com. 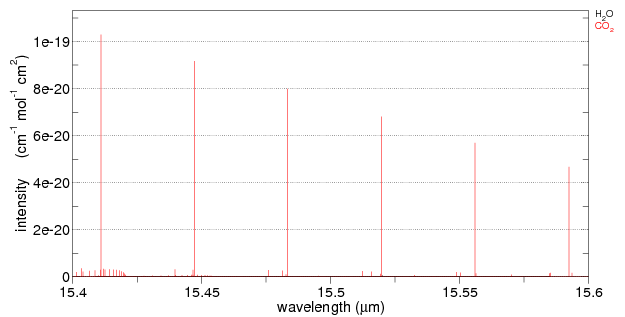 The line list only goes down to 0.17μm (170nm), hence the reason for the graph not starting at 0.0μm. The solar radiation is overlaid. Well, more accurately, the Planck function for 5780K is overlaid (simply drawn using Excel). Note that the CO2 absorption spectrum is on a log graph, while the radiation is on a linear graph. 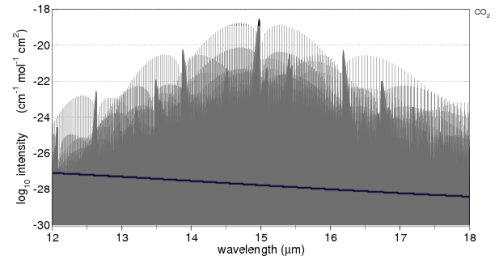 For those not so familiar with logarithmic graphs, the peak absorption around 4.3μm is 10-18, while the two peak absorptions just below 1μm are at 10-26 – which is 100,000,000 less. The value of seeing the solar radiation spectrum overlaid is it enables you to see the relative importance of each absorption area of CO2. 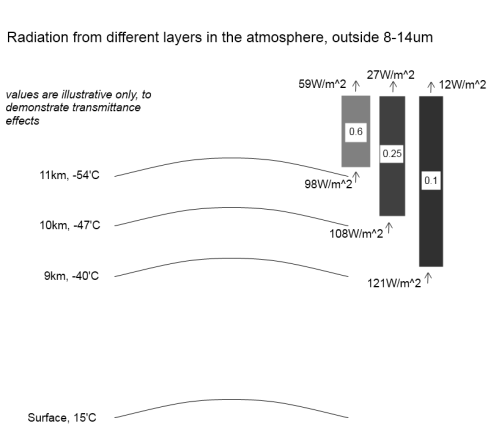 For example, the solar radiation between 2 – 4μm is only 5% of the solar radiation, so any absorption by CO2 will be quite limited. Just a little explanation of this graph and how to compare it to the solar version. 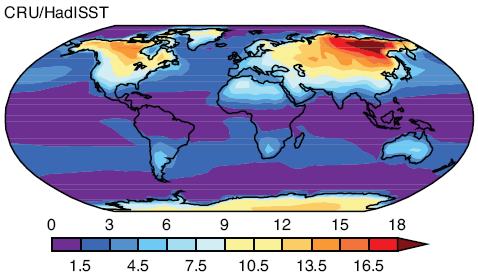 The average surface temperature of the earth is 15ºC, and it emits radiation very close to blackbody radiation (watch out for a dull post on Emissivity soon). 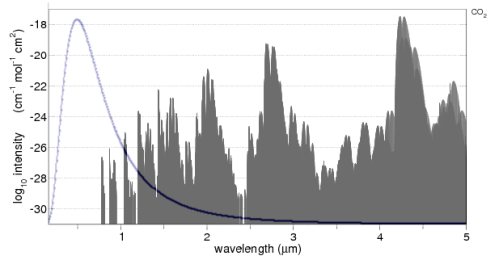 The proportion of radiation of a 288K blackbody between 12-18μm is 28%. 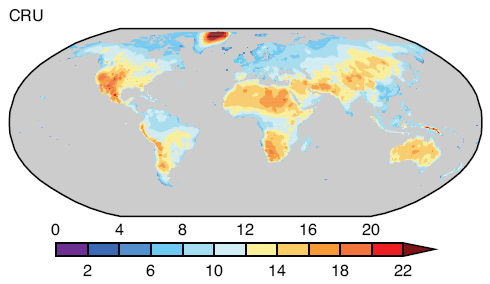 What we want to do is enable a comparison between the CO2 absorption of solar radiation and terrestrial radiation. Averaged across the globe and the year the incoming solar radiation at the top of atmosphere (TOA) is 239 W/m2 and the radiation from the earth’s surface is 396 W/m2. This works out to 65% higher, but so as not to upset people who don’t quite believe the earth’s surface radiation is higher than incoming solar radiation I simply assumed they were equal and scaled this section of the earth’s terrestrial radiation to about 28% of the solar radiation on the earlier graph. We are only eyeballing the two graphs anyway. 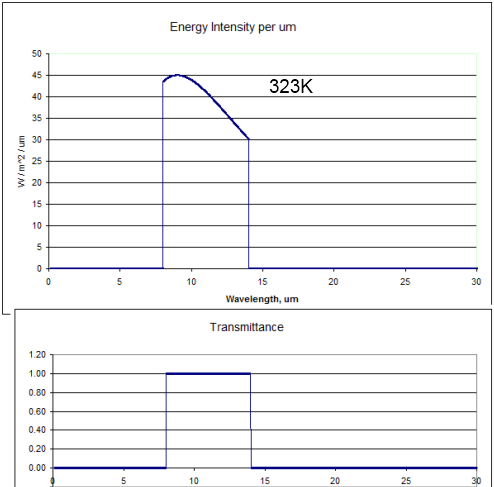 So with this information digested, the way to compare the two graphs is to think about the absorption spectra of CO2 simply being scaled by the amount of radiation shown overlaid in both cases. 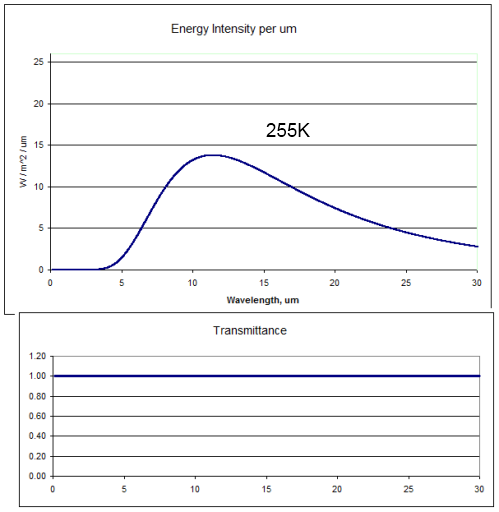 As you can see the amount of absorption by CO2 of solar radiation is a lot less than the absorption of longwave radiation. Remember that we are looking at the log plot of absorption. Is That the Complete Story? Really, it’s more complicated, as always with atmospheric physics. There’s nothing wrong with taking a look at the approximate difference between the two absorption spectra, but luckily someone’s already done some heavy lifting with the complete solution to the radiative transfer equations using line by line calculations. For more on these equations, see the CO2 – An Insignificant Trace Gas series, especially Part Three, Four and Five. 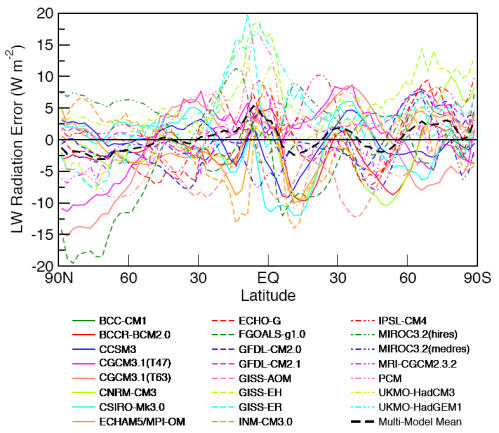 The paper with the heavy lifting is Radiative forcing by well-mixed greenhouse gases: Estimates from climate models in the IPCC AR4 by W.D. Collins (2006). There’s a lot in this paper and aspects of it will show up in the long awaited Part Eight of the CO2 series and also in Models, On – and Off, the Catwalk. Solving these equations is important because we can look at the absorption spectrum of CO2 in the 15μm band, but then we have to think about the absorption already taking place and what change in absorption we can expect from more CO2. Likewise for the solar spectrum. Here are the two graphs, which include other important trace gases, as well as the impact of a change in water vapor. 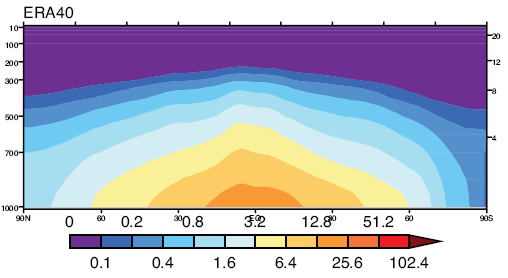 Note the difference in vertical axis values – the forcing effect of these gases on solar radiation has to be multiplied by a factor of 1000 to show up on the graph. The blue lines are CO2. 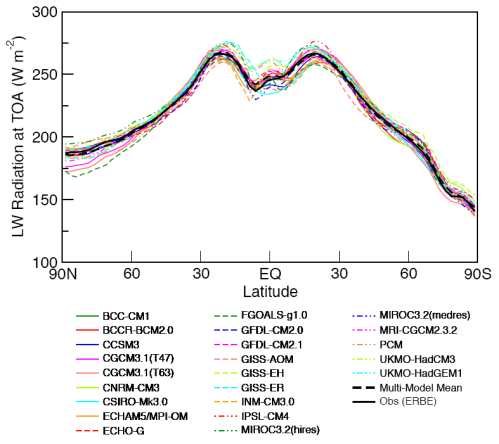 You can also see that the CO2 absorption in shortwave is across quite narrow bands (as well as being scaled a lot lower than terrestrial radiation) – therefore the total energy is less again. 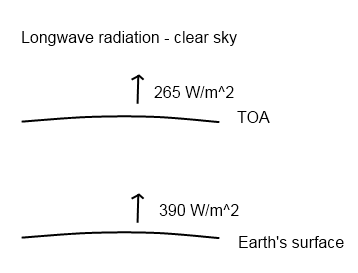 The vertical scale is energy per μm..
From these calculations we can see that with a doubling of CO2 there will be a very small impact on the radiation received at the surface, but a comparatively huge increase in longwave radiation retained – “radiative forcing” at the tropopause (the top of the troposphere at 200mbar). So Is That the Complete Story? Not quite. If trace gases in the atmosphere absorb solar radiation, is that so different from the surface absorbing solar radiation? Or to put it another way, if the radiation doesn’t strike the ground, where does it go? It’s still absorbed into the climate system, but in a different location (somewhere in the atmosphere). The other point [this one] you make is simply not true and/or also not proven. There is only so much energy that can be taken up by a molecule. This is a theme that has arrived in various comments from various posts. So the concept of How much work can one molecule do? is worth exploring in a separate post. Hopefully, it’s clear from what is presented here that increases in CO2 absorption of the solar radiation are very small compared with absorption of longwave radiation. 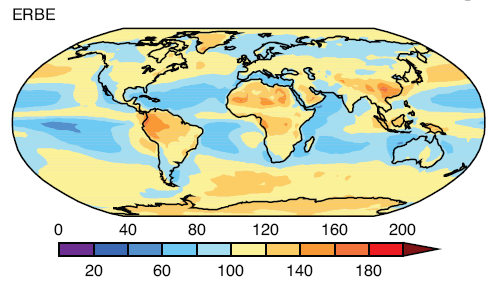 There’s a paper out which has created some excitement, On Falsification Of The Atmospheric CO2 Greenhouse Effects, by Gerlich & Tscheuschner (2009). It was published in International Journal of Modern Physics B. I don’t know what the B stands for. 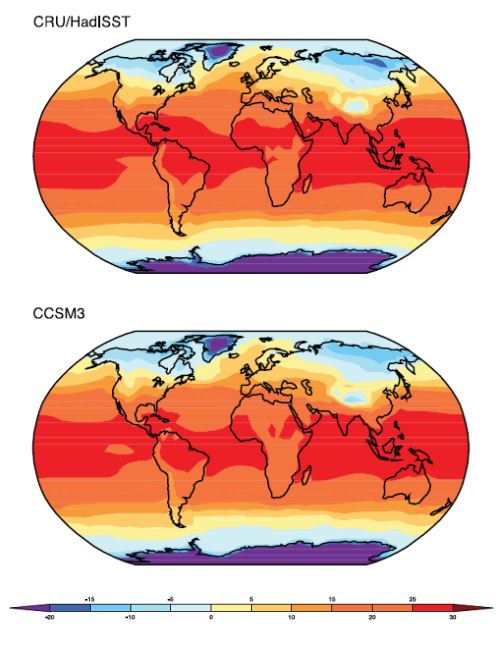 Usually I would try and read a paper all the way through to understand it, then reread it.. but I got as far as page 55 out of 115 – even the seminal Climate Modeling through Radiative Convective Methods by Ramanathan & Coakley (1978) paper only had 25 pages. First, a lot of time was spent showing that greenhouses and bodies surrounded by glass (or anything that stops air movement) retain heat not because of absorption and reradiation of longwave energy but because convection is reduced. Why spend so long on it when everyone agrees. Sadly the “so-called greenhouse effect” became that because it passed into common language to describe this effect even though it’s not the right description. I tried to think of a good analogy, something to bring it to life.. But didn’t mention greenhouses, because the greenhouse isn’t a good analogy.. This is a concern if it’s a serious paper, because attacking arguments that no one agrees with is the strawman fallacy, a refuge of people with no strong argument. Lee continues his analysis with a calculation based on radiative balance equations, which are physically questionable.. 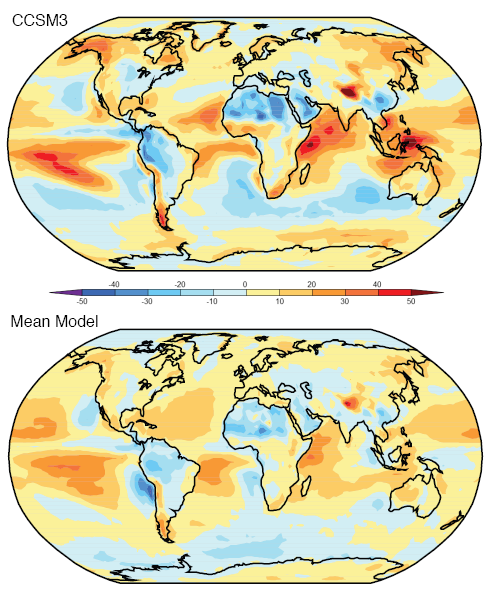 Nevertheless, Lee’s paper is a milestone marking the day after which every serious scientist or science educator is no longer allowed to compare the greenhouse with the atmosphere, even in the classroom, which Lee explicitly refers to. The authors of this paper don’t actually explain where Lee’s equations are questionable, instead draw attention to a day that should be marked down in history.. and use that to show that anyone mentioning “greenhouses” have got it wrong. 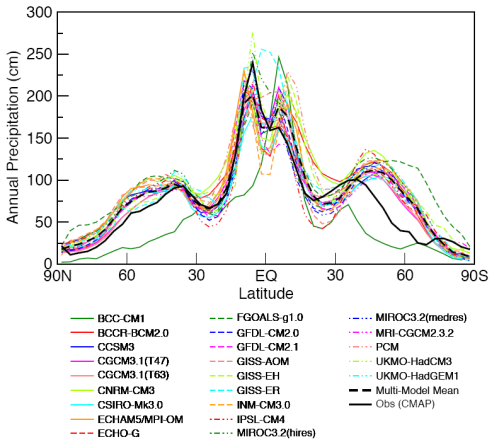 None of the papers that discuss the radiative-convective method actually argue from the greenhouse. So why are the authors of this paper spending so much time on it? Second, attacking poor presentations with a mixture of correct (but really irrelevant) and incorrect arguments. They cite, not a paper, but an Encyclopedia..
Disproof: Firstly, the main part of the solar radiation lies outside the visible light. Secondly, reflection is confused with emission. Nice. They have brought this up a few times. 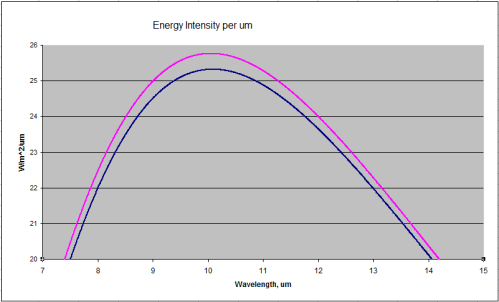 Yes, technically we call infrared that part of the radiation that is longer wavelength than visible light. 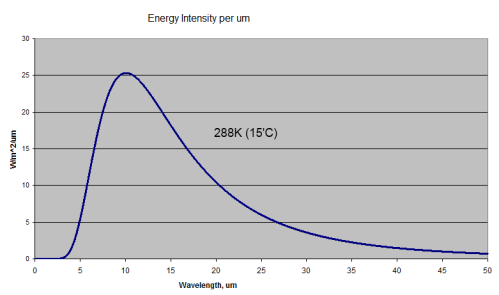 So anything >700nm is infrared. Any yet, in common terminology, often cited to a point of pain, we use “longwave” to mean that radiation over 4μm because 99% of it is radiated from the earth, and we use “shortwave” to mean that radiation under 4μm which is solar radiation. So their first “disproof” isn’t a disproof. And their second one is simply picking a terminology mistake in an encyclopedia. Yes, the encyclopedia has mixed up the phenomenon. Why are they citing from this source? Third, another example of “destroying” the opponent’s argument.. The infrared radiation that is emitted downwards from the atmosphere (the so-called back-radiation) raises the energy supply of the Earth’s surface. 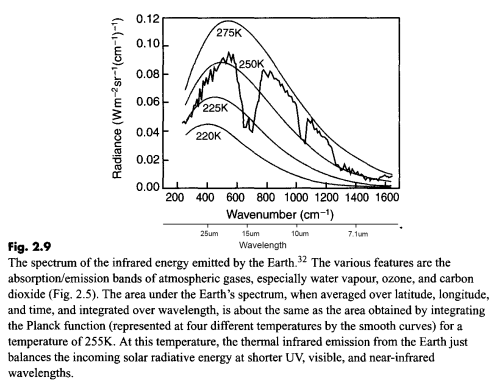 The assumption that if gases emit heat radiation, then they will emit it only downwards, is rather obscure. It wasn’t what their source actually said. Their source didn’t say, or imply, that radiation was emitted only downward. Fourth, and most importantly, the paper gives the appearance of discussing prior work by discussing a real mix of very old work and lots of more recent comments by people in their “introduction” to something quite different. That is they are citing from papers which are introducing another subject while not attempting to demonstrate any formal proof of the inappropriately named “greenhouse effect”. They don’t discuss the relevant modern work that attempts to prove the relevance and solution of the radiative transfer equations. They do reference one key paper but never discuss it to point out any problems. 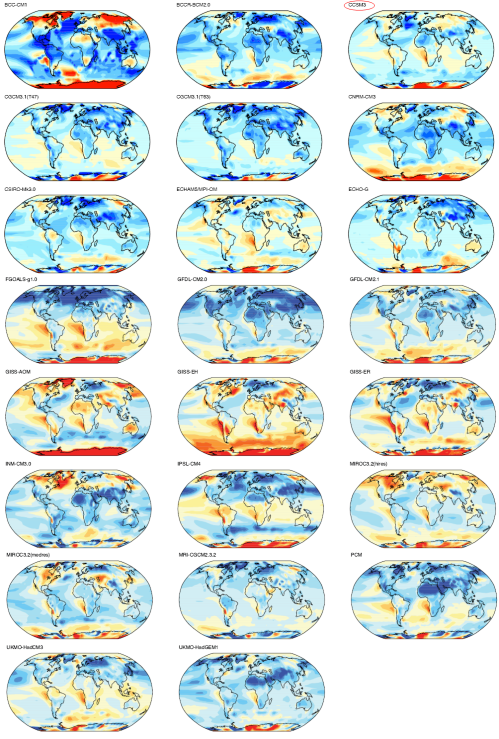 cant influence on the formulation of the modern atmospheric CO2 greenhouse conjectures and hypotheses, respectively. The work that most recent papers on the solution to the radiative transfer equations discuss or cite is Ramanathan and Coakley (1978) – often along with a citation of M&S – and of course Ramanathan and Coakley cite and discuss Manabe and Strickler (1964). That is, anyone calculating the effect of CO2 and other trace gases on the surface temperatures. Why not open up these two great papers and show the flaws? Ramanathan and Coakley are never even cited. Manabe and Strickler aren’t discussed. R&C is 25 pages long and works through a lot of thermodynamics in their paper. If Gerlich & Tscheuschner want to get a result, show their flaws. It should be a breeze for them..
One day I may find the energy to read and reread all 115 pages and do them justice. Perhaps there is some revelation inside. More likely, they are having a laugh. Otherwise why is half the paper nothing to do with disproving the theory that modern atmospheric physicists believe? I’m sure they would say otherwise.. And I’m certain we would get on great over a few drinks. If we drank enough I’m sure they would admit they did it for a bet.. If Gerlich & Tscheuschner want to be taken seriously maybe they can write a paper which is 20-30 pages long – it should be enough – and they can ignore greenhouses and encyclopedia references and what people say in introductions to less relevant works. Their paper could reference and discuss recent work which from first principles demonstrate and solve the radiative transfer equations. And they should show the flaw in these papers. Use Ramanathan and Coakley (1978) – everyone else references it. 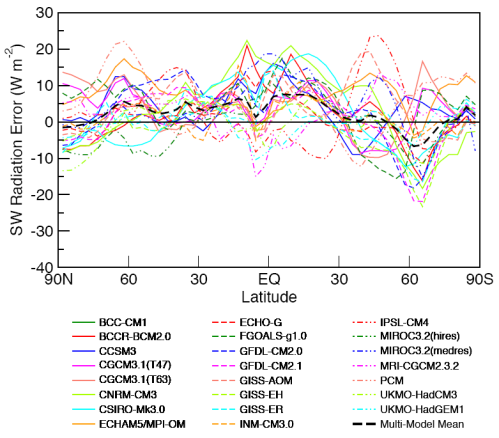 On that paper: Climate Modeling through Radiative Convective Methods – R&C are into the maths by page 2 and don’t mention greenhouses. I would recommend this excellent paper (you should be able to find it online without paying) to anyone who wants to learn more about the approach to solving this difficult but well-understood problem. Even if you don’t want to follow their maths there is lots to learn. Gerlich & Tscheuschner waste 50 pages with irrelevance and poorly directed criticism.. if they have produced a great insight it will be lost on many. 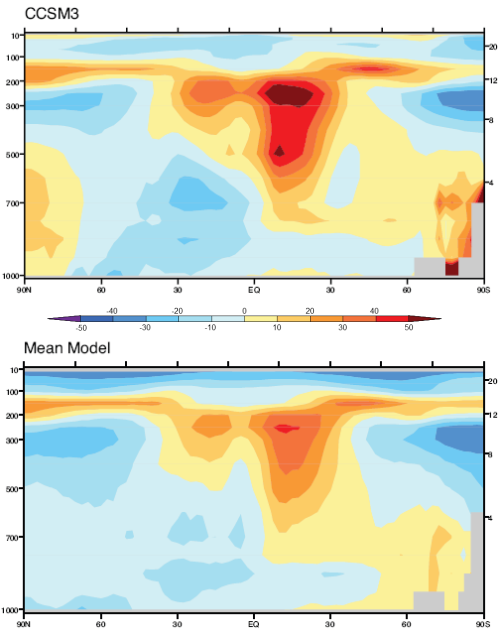 In New Theory Proves AGW Wrong! I commented that many ideas come along which are widely celebrated. Some “disprove” the “greenhouse effect” or modify it to the extent that if their ideas are correct our ideas about the (inappropriately named) greenhouse effect are quite wrong. 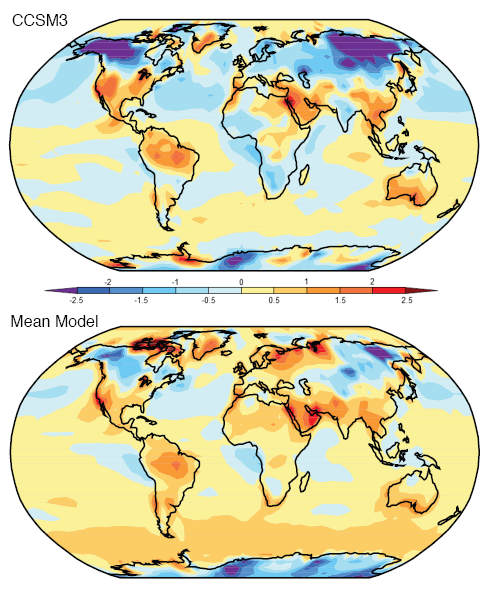 Some disprove AGW (anthropogenic global warming). There is a world of difference between the two. This paper falls into the first category. I also commented that the papers in the first category usually disprove each other as well, so it’s not “one more nail in the greenhouse effect” – it’s “one more nail in the last theory” and the theories that will inevitably follow. 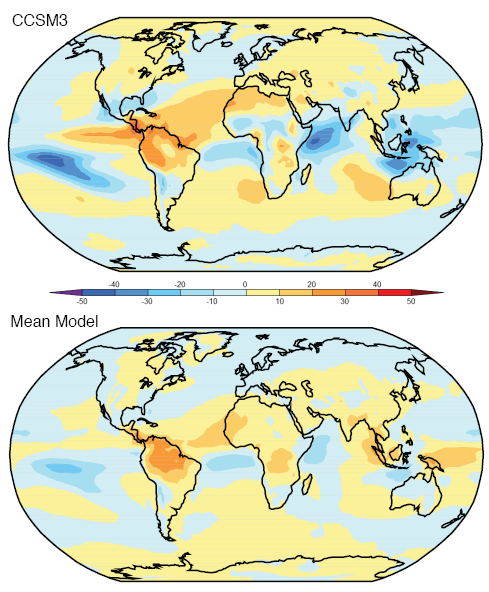 Interestingly (for me), since I wrote that article: New Theory Proves AGW Wrong! someone produced a list of a few papers that I should “disprove”. One was this paper by Gerlich and Tschueschner, another was by Miskolczi. Yet they disprove each other and both disprove what this person promoted as their own theory. This doesn’t prove anyone wrong – just they can’t all be right. One or zero..
And I’ll be the first to admit I haven’t proven Gerlich and Tschueschner wrong in their central theory. I have pointed out a few “areas for improvement” in their paper but these are all distractions from the main event. More interesting stuff to do.